As discussed in a previous blog, the use of iPads (and other tablets) and laptops can be the cause of discomfort and fatigue in the neck, shoulders, eyes and wrists. Despite this, tablet accessories that could help to reduce the discomfort are not widely used. This is because the accessories are seen as too expensive, awkward or simply not needed. This could be because when we use laptops or tablets with incorrect posture, it is not immediately uncomfortable. 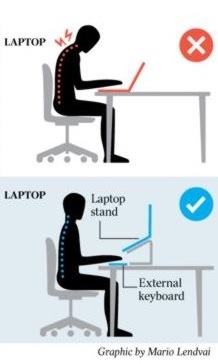 After having taken into consideration the points discussed in our previous email on correct posture in the office environment, the next most important issue it to get laptop and tablets in a configuration that helps to achieve a similar correction in posture. Separate monitor if the laptop or tablet is not big enough to be seen easily at an arm’s length away and for an extended period of time. If you are uncertain as to what to use to create an ergonomically effective set up, the chiropractors at Headingley Chiropractic Clinic would be happy to help. Please feel free to call us on 0113 228 9888.